Backpacks make a gift which is useful as well as pretty and our crochet backpacks not only come in lovely colours, but of course every one has a small teddy in the front pocket. Our backpacks are made in light rose pink (like the backpack here), baby blue, lilac, or red (a lovely colour for Christmas). All backpacks have a cream trim and full cotton or silk lining to match the yarn colour used. They have lots of room inside to carry toys, school books, or even to act as a pretty lunch bag, and the pocket is not only big enough to carry a 5 inch teddy, it is also roomy enough to take other items if you prefer. At fairs and markets, each backpack with teddy will cost £8.00. For anyone who wants to purchase one of these lovely backpacks, but cannot get to our fairs or markets in the Portsmouth area, I will also be adding them to the Etsy shop soon, but there will be an additional charge of £2.95 for postage, packing and processing when purchased there. 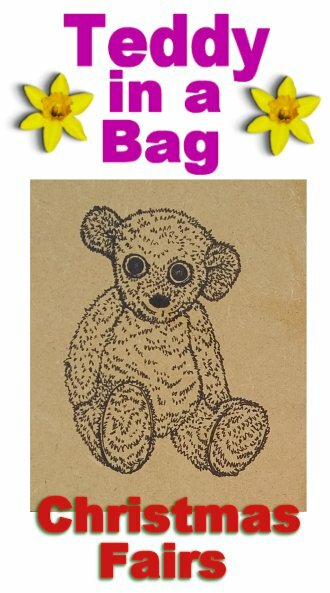 Posted on October 30, 2018 November 6, 2018 by Silvi VealePosted in Backpacks, Teddy in a bagTagged all ages, backpack, Children's bags, Crochet Bags, satchel bag, Shoulder Bags, small teddy.